According to Panzer Tracts the correct designation for this vehicle is Panzer IV/70(A). 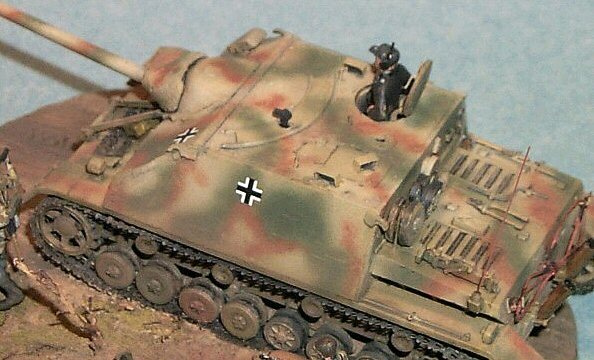 Even though the term Jagdpanzer IV has become common, according to Thomas Jentz’s, the term “Jagdpanzer” was never actually officially used for this particular long barrelled AFV by the Germans during the war. Of the three major variants of the "Jagdpanzer IV", the Alkett company produced this particular version, hence the “A” designation after the gun caliber number. (The other version is the Pz IV/70(V), produced by Vomag.) Comparing the Alkett and Vomag versions, the difference is extremely obvious. Alkett attached the modified superstructure of the Vomag version atop the regular Pz IV tank chassis making it significant taller. Of 278 Pz IV/70 (A) vehicles produced, the first 50 apparently had Zimmerit coating. 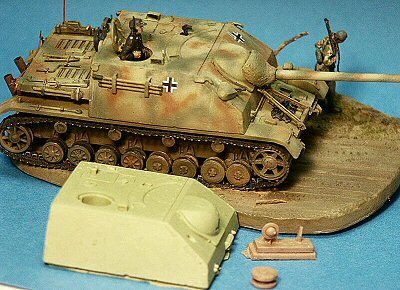 Though there are several resin models or conversions for this vehicle, I have not yet found an all plastic release of the Pz IV/70(A), but lots of Pz IV/70(V) kits though. This strikes me as odd considering the propensity of model companies to model anything German from WW2, even paper panzers. Though you may not be able to easily find one of these LEVA conversions, I hope this article will help with other resin conversion kits that are more available. Leva conversion kit no. 72-C-04 consists of 23 cast resin parts. 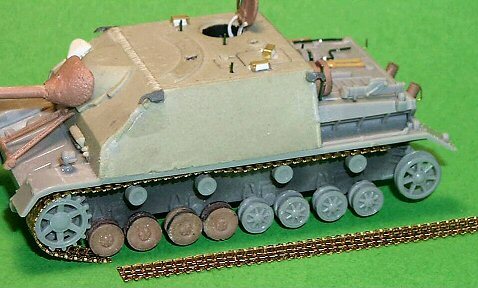 Not a full kit, it is designed to mate with the chassis and suspension of a 1/72-scale Panzerkampfwagen IV kit. 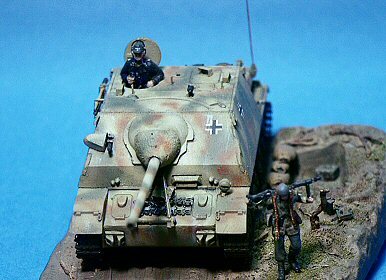 At the time this conversion was produced by Leva in the late 1990's the only kit available was ESCI's Pz IV Ausf. G kit. Technically the ESCI Pz IV G kit is not appropriate as the Pz IV/70(A) was built on the Pz IV J. The quality and accuracy of the ESCI kit aside, the most obvious problem with using this old kit is the lack of the late war cast idler wheel. This is one of LEVA’s early conversion kits, but it is still very nice. Included are a solid superstructure, ten steel-rimmed roadwheels (eight for the front stations & two spares), a well molded gun & mantlet, Flammentoeter mufflers, gun travel lock, superstructure lift-hooks for the corners, gun-cleaning rods, and MG-port cover. The superstructure comes with an open loaders hatch, drivers viewport molded on, the MG-42 machine gun port, and well-done weld seams for the interlocking armor. Also included is a rooftop fitting for the MP44 rifle with the 90 degree curved barrel for ridding yourself of those pesky assaulting infantry. At top is the large cast superstructure, or upper hull, designed for use with the ESCI Pz IV kit or Brummbär kit, or the Hasegawa, Revell or Dragon Pz IV kits (with conditions). The Pz IV/70(A) was built upon the PzKpfw IV Ausf J tank which means we need the features of that hull; some are supplied by LEVA, some not. More on this below. To the left of the superstructure is the long L70 gun and mantlet molded as one unit, then continuing counter clockwise we have the pour plug holding two flame arrestor exhaust pipes as seen on the Pz IV Ausf. J, a pour plug holding the self defence weapon (Nahverteidigungswaffe), the machinegun port cover, the loader's hatch, and the gun cleaning rods. The dark gray pour plug holds four lifting hooks for the superstructure corners. And last are two pour plugs containing five steel roadwheels each. 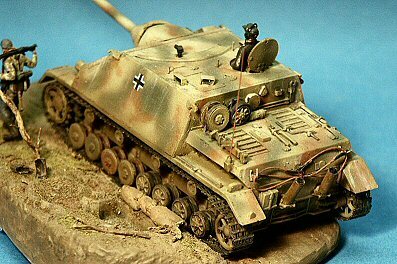 At the time I built this model I had a choice for the lower hull and suspension of either the old ESCI Pz IV kit, or the Hasegawa Pz IV kit (The excellent Revell Pz. IV kit was not yet available). 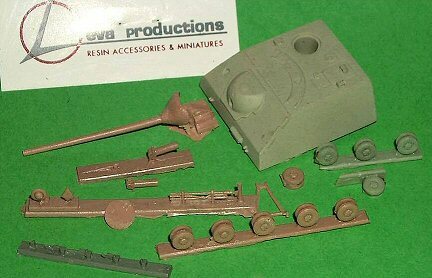 Though LEVA gives us most of the parts needed for a successful conversion it is missing historically important items: the late war cast idler wheel, cast sprocket wheel and steel return rollers as used on the Pz IV Ausf, H and the Pz IV Ausf J. These late Pz IV wheels are presently available in the Revell Pz IV J kit #3122 and the Dragon Pz IV H kit #7497. 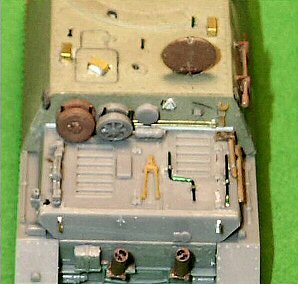 At the time I built this kit, this idler wheel was available in the 1/72-scale ESCI Sturmpanzer IV Brummbär kit 8065 (also sold as ESCI/Ertl kits 8307 and 8311). Except for the wheels the Hasegawa hull and superstructure are well done. Using one of the less than ideal Hasegawa Pz IV kits here, part of the Hasegawa kit superstructure is cut off and replaced by the LEVA cast resin hull. Upon the superstructure roof the periscopes have been replaced by brass strip and styrene blocks. I find it interesting and odd that it is the loader's hatch that is cast open on the superstructure, typically it is the commander's hatch that is modelled open. The three short wire rods on the roof are for mounting a jib crane. On the right superstructure side are mounted the gun cleaning roads. At each of the superstructure corners are simple hooked plates for lifting the superstructure. On the turret roof the lifting hooks are missing on the corners. On the rear superstructure plate are various tools and an exhaust vent. On the engine deck are two spare roadwheels mounted on simple vertical rods and assorted tools stolen from the Hasegawa kit, ESCI parts and MarS resin accessories. On the rear engine plate note that the hooks for holding the tow cable are located at each far end of the plate..The exhaust muffler has been replaced by LEVA's two flame arrestor exhaust stacks like those found on the late Pz IV Ausf. J. Both ESCI's and Hasegawa's tracks are pitiful and at this time the next best replacement was an etched brass track from Part Company, of Poland. The etched detail is beautiful but the track is too thin. too flat. Presently I would prefer any number of aftermarket track or track from a Dragon or Revell Pz IV model kit. It pains me to see the poorly portrayed Hasegawa roadwheels, idler and drive sprocket. For a historically accurate model the return rollers should be the all steel type not these which represent the rubber tired return rollers. A view of the left side shows the excellent gun mantlet with cast in texture, the gun travel support. These sprocket, road and idler wheels are originally from Hasegawa's Munitionspanzer IV in the Karl mortar kit #31033/MB 33 and are just plain dreadful by today's standard, the spokes are just too prominent. (Fortunately they have been replaced by very nice wheels in current Hasegawa Pz IV kits.) The sprocket and idler wheels are not the correct type for a production Pz IV/70(A). Leva's steel roadwheels are nicely done though. The PART etched-brass tracks are folded and ready for painting. I used the Panzer III tracks which were long enough to use with the Pz IV and still have a little extra for the spare links carried. 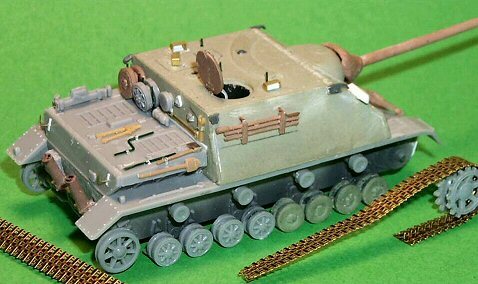 The PART Pz IV tracks are considerably longer than the Pz III track set and comes with small pieces to glue onto each link to make the tracks more accurate in scale-thickness. The tracks look a little thin, but considering that styrene plastic and rubber band tracks are typically too thick, this is acceptable to me. The beautiful relief and hollow guide teeth outweigh many drawbacks in my opinion. Folding them and connecting the ends is easy. The completed LEVA-Hasegawa conversion in a mini-diorama set in March-April 1945. The gunner’s periscope is scratchbuilt from styrene rod, the tow cable from coarse thread. Paints used were Poly-S and Model Master acrylics with an Iwata Eclipse airbrush. The PART brass tracks were painted first with dark gray enamel auto-primer, followed by a light dust coating with the rest of the model, then rubbing the high spots and guide teeth with a graphite pencil to represent wear. The only markings are 1/72 scale crosses and a tactical marking from Archer Fine Transfers. The machine gun port cover that came with the LEVA conversion did not match that seen in my reference photos so a new one was scratchbuilt with thick styrene; looking at it now it may be a little too thick. Because of the heavier armor in the front and the large superstructure the vehicle had the four steel tired roadwheels per side and should be lower, dipping in front, looking front heavy. In hindsight I could have modified the front leaf spring suspension to portray the nose dipping down. It also looks like several of the roadwheels are not sitting on the track like they should be, oops. The Part etched brass tracks look a little thin to me. They do have the later war open track teeth which is good and we do not find in plastic. The rear idler wheel and the sprocket wheel should be the later cast styles as seen on the Pz IV Ausf. J not this welded type but, alas, I used what I had available at the time. The rear mudguard is missing the cut-out for the spring at the hinge area, another oops. Overall I am very pleased with the conversion and the final model. Assembly was straightforward though detailing can be a challenge. For those interested, scratchbuilt wire-mesh side skirts can be added, the skirts would have masked or distracted from the poor roadwheels. The LEVA conversion was originally designed for the old 1/72-scale ESCI Pz IV, though the Revell Pz IV J kit #3122 and the Dragon Pz IV H kit #7497 are more accurate and detailed substitutes. With all the good styrene plastic, 1/72-scale Panzerkampfwagen IV variants, such as by Revell AG, Dragon, Trumpeter and even the decent Hasegawa kit, I am puzzled that none have released this version of the Panzer IV/70 in plastic. I found a lot of references for this vehicle but good references were not common. PANZER TRACTS No. 9-2 Jagdpanzer, (2012) by Thomas Jentz & Hillary Doyle is the best and most up to date I know of. I recommend all of the PANZER TRACTS series.